When a ship delivers copies of the day's menu as part of the daily bulletin, you know it's serious about food. We noticed passengers perusing these menus around the pool, plotting what they were going to have for lunch and dinner. No surprise, the choices are many, and if you don't study the menus closely, you might miss a tasty morsel that other passengers will be gushing about later. We agreed with our fellow travelers that this is the best food we've had at sea. With five dining venues, plus a copious afternoon tea (complete with a string quartet), we never went hungry. In general, the food could compete with fine land-based restaurants. Only when it came to fish did we feel let down a bit, mostly because the fish tended to be overcooked and on the dry side. Otherwise, we found the ingredients to be luxurious, the flavors sublime and the selection extraordinary. Nautica doesn't offer any added-fee dining; all restaurants are free to all passengers, although access to the two specialty restaurants is limited. The service in both specialty restaurants is admirable. We especially appreciated that the usual white napkins were exchanged for black ones when a diner was wearing dark clothing. Details like that truly make passengers feel cosseted. 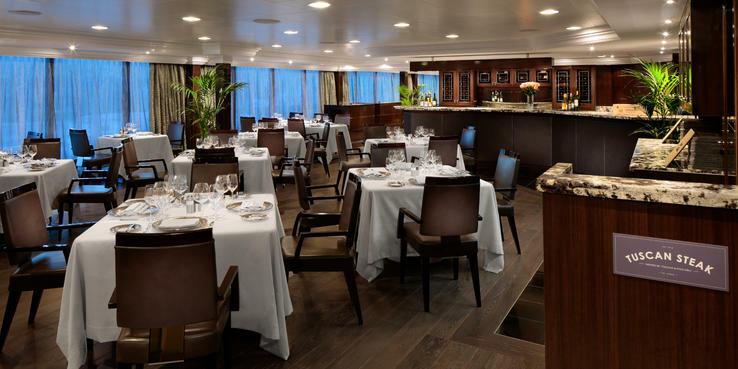 The Grand Dining Room (Deck 5): Nautica's elegant main dining room seats 352 and serves breakfast, lunch and dinner. It's decorated in traditional style, with brocade curtains, shades of gold in the fabrics and wood paneling. Tablecloths are white, the silverware is substantial, and you'll be sipping from Riedel crystal. We were particularly impressed by the Versace service plates, with rims decorated in a lavish floral design. (See if you can find the painted ladybug.) Waitstaff are dressed formally, and wine stewards call on tables to help navigate wine choices. Plenty of tables for two line the aft windows, while larger tables fill in the rest of the room. To break up the space a bit, an ornate railing surrounds the central area. Seating is open, and we never had to wait for a table -- although, on some occasions, that meant sharing a larger table. In addition to the Continental-style food that's a hallmark in this venue, Nautica's chef offered a number of Asian-focused choices on our Asian itinerary, including recipes from Red Ginger, a specialty restaurant aboard other Oceania vessels. There are also recipes from Jacques Pepin and a menu section devoted to Canyon Ranch Spa dishes, with the calorie counts noted. At breakfast, the menu offers smoothies, juices, hot and cold cereals, yogurt, eggs to-order, omelets, a daily egg special (huevos rancheros, for example), steak, lamb chops, smoked salmon, finnan haddock, kippers, bacon (pork or turkey), sausages (ditto) and other sides, including a choice of three different types of potatoes. The menu also lists more than a dozen bread and pastry choices -- and trust us, they're luscious. If that's too much, there's a Canyon Ranch section, with items like an egg-white scramble and apple muffin. Or, if you're in a rush, an express option offers scrambled eggs, toast and bacon. Lunch brings a bounty of choices, with Jacques Pepin signature items like a Nicoise salad, Canyon Ranch fare and a daily themed section focused on a type of cuisine -- Asian, Greek or Italian, for example. A nice option from this corner of the menu is the sampler plate for two, which gives you appetizer portions of six or so different dishes. You also have plenty of European-inflected choices among the daily soups, appetizers, main courses and desserts. At both lunch and dinner, at least one dessert is offered in both sugar-free and regular forms. Dinner continues the cavalcade of deliciousness with a four-course degustation menu option (complete with suggested wine pairings by the glass) or an a la carte section that includes at least 10 appetizers, soups and salads, plus 12 main courses. Among those are Jacques Pepin signature dishes, like steak frites and poulet roti (herb-crusted rotisserie chicken) and items from Red Ginger and Jacques, specialty restaurants on other ships in the fleet. These choices are a relatively new option, and they were happily greeted by Oceania veterans who fondly remembered the restaurants from other sailings. There's also an appetizer, salad and main course on the Canyon Ranch menu. It's possible to mix and match among any of the dishes, so the hardest part is just making up your mind. The dessert menu typically offers five tempting regular choices (and by "regular" we mean things like warm milk chocolate tartlet with passion fruit sorbet), a Canyon Ranch item (we recommend their chocolate mousse), a sorbet, five ice cream choices (often creative flavors like creme brulee or lemon tart) and a cheese plate. If you still have room, you can finish off with homemade cookies and petits fours. The Terrace Cafe (Deck 9): This is Nautica's casual 220-seat buffet restaurant, and it also serves all three meals. With floor-to-ceiling windows, plus an outdoor area with both shaded and sunny tables, the feel of this venue is all light, sky and water. That's complimented by decor accented with wood and marble-topped serving counters. You actually don't help yourself there; you indicate to servers what you'd like from the food you see displayed. This is certainly better from a health safety standpoint, but it can be frustrating in the midst of breakfast mayhem on a port day, when a mob is waiting to be served. Breakfast choices are pretty much in line with what you'd find on another upper-end ship, including smoked salmon and herring, berries and other fresh fruit, eggs and omelets to order, daily specialty eggs (different sorts of Benedicts, for example), bacon, sausage, pancakes, cereals, yogurts and a wicked assortment of pastries. (We were particularly smitten by the gooey sticky buns, served warm.) We usually ended up going with ready-made items because the egg stations tended to get backed up, particularly on port days. Lunch brings a salad bar; an array of cold cuts and antipasto items; prepared salads; a carvery that offers items like roasted meats or salmon in puff pastry; a burger bar; fish of the day; a pasta station; two pizza choices; assorted hot entrees, side dishes, fruit and six or so desserts, plus ten ice cream choices. There's a real international variety among the offerings. One day, the crew might be assembling bouillabaisse before your eyes, and the next there's an Asian stir-fry and spring rolls or jerk chicken with dirty rice. At dinnertime, things get a little fancier, with the addition of lobster tails, steak and lamb chops prepared to order; sushi and sashimi; charcuterie; a pasta station; fish options; and creative fare ranging from escargots to sesame chicken. Polo Grill (Deck 10): This clubby 90-seat dinner-only restaurant specializes in steaks and chops -- though there are choices for fish-lovers, too. Seating is by reservation, and passengers in regular cabins are officially offered one advance-reservation night of dining there, while Concierge Level passengers get two nights. In practice, we found that it was possible to get on a waiting list and score a same-night table, particularly on shore days when people with late reservations had more tendency to cancel. Polo Grill offers classics, done well, with appetizers like colossal shrimp, oysters Rockefeller and generous lump crabcakes; clam chowder, navy bean soup and lobster bisque; a cobb salad; and potatoes au gratin, onion rings and green beans amandine among the 11 sides (though you can get trendy lobster mac and cheese, too). For the main attraction, choose from prime rib (the best we've ever tasted), porterhouse, ribeye, New York strip and filet mignon. You'll also find an Iberico de Bellota pork chop, rack of lamb and roasted chicken. Or, try one of five seafood choices, ranging from lobster to tuna, plus a surf and turf. Choose from five classic sauces on the side. Can't make up your mind about dessert? Opt for the sampler, with five petite portions that let you try everything, including cheesecake, creme brulee and a crumble. Toscana (Deck 10): For a gracious Italian experience, head to the ship's other dinnertime specialty restaurant. Also with just 90 seats, it operates by the same rules as the Polo Grill. This is definitely not your checkered tablecloth Italian, but the sort of chic experience you'd find at a restaurant in Milan. The meal begins with a menu of olive oils from which you choose to complement your bread. The menu offers both cold and hot antipasti, including carpaccio of both beef and octopus, caprese salad and a luscious artichoke and parmesan timbale with black truffle sauce. There are two soups, including a classic minestrone, followed by a choice of nine pastas and two risottos (one with lobster), plus a daily special. The pasta and gnocchi are made onboard. The three salad offerings include a classic Caesar, made at the table. Meats dominate the 10 main courses, with choices like veal scaloppine and osso buco. We loved our monster veal chop smothered in porcini mushroom sauce. Non-carnivores can opt for lobster, sea bass or Dover sole, a favorite at my table, sauteed in lemon and parsley butter. Dessert samplers include adorable mini-cannoli. Waves Grill (Deck 9): The ship's most casual dining spot is located on the pool deck, and it operates during breakfast and extended lunch hours. The 80 seats are all outdoors, but in the shade. Early risers will want to hop up there for morning coffee, pastries, fruit and yogurt, since it usually opens an hour prior to the buffet. At lunchtime, Waves offers a salad and fruit bar, five different beef burgers (the "Kobe" is Wagyu beef with black truffle sauce, salmon, tuna and veggie burgers, plus additional hot specialty sandwiches like the "surf & turf," with lobster and filet mignon, served with parmesan-dusted truffle fries. You can also order ice cream, milkshakes, malts and smoothies there. Afternoon Tea (Horizons Lounge, Deck 10): Afternoon tea is served between 4 p.m. and 5 p.m., with nearly a dozen types of Twinings teas and a luscious array of traditional pastries, scones and finger sandwiches. On some days, there's a specialty tea, such as one focused on cupcakes. As afternoon tea aficionados, we appreciated that Nautica served real clotted cream with their scones (not falsely labeled whipped cream as some ships do). As an extra touch of elegance, the string quartet performs when tea is served. Room Service: 24-hour room service is available in all cabins from a special menu in the cabin information book. The menu offers only a Continental breakfast unless you're in a Concierge Level cabin or suite, where hot breakfasts can be delivered. Examples from the all-day dining items include shrimp cocktail, French onion soup, salads (Caesar and Cobb), sandwiches, burgers, beef filet, chicken breast, pizza, pasta and seven desserts, including a low-fat "after the gym" yogurt smoothie. A couple of Canyon Ranch choices are also available. In addition to choosing from the in-room menu, passengers in suites can opt for course-by-course dining and can order-in from the ship's specialty restaurants.